I was poking around local and genealogical websites looking for clues as to whether Lt. John Anderson of the 19th Infantry in 1812 was related in some way to Colonel John Anderson of the 2nd Michigan Regiment of Militia. Since Lt. Anderson, a West Point graduate whom I featured in my last "people of 1812" post, had settled in the Detroit area before being called back to the flag, I thought it possible he might be the son or nephew of the other Anderson. Such family connections were not uncommon during the war, and formed an important social tapestry underlying many events. At any rate, I found this entry for a Monroe County veteran, Private James Bentley very interesting. Seems Bentley was a British deserter from the Battle of Copenhagen in 1801, who found himself caught up once again in the tides of war in 1812. He is listed as a Private in Captain Richard Smyth's Company of Cavalry, Legionary Corps of Michigan. Part of this unit, under Cornet Isaac Lee, was stationed in Frenchtown (Monroe) Michigan and fled south to Urbana, Ohio instead of surrendering. The distinction between the Legionary Corps and the Militia is important. The Corps was made up of volunteers, and Bentley may well have armed and equipped himself as a cavalryman for the war with Britain out of his own funds. James Bentley . Born Nov. 5, 1784 in England, he died Aug. 13, 1864. He married Amanda Barker, born Dec. 12, 1800, on Jan. 31, 1816. She died Apr. 18, 1889, in Monroe. They are buried in St. Paul's Cemetery in Monroetown. Mr. Bentley served as a non-commissioned officer under Gen. James Winchester and his wife was a witness to the war. 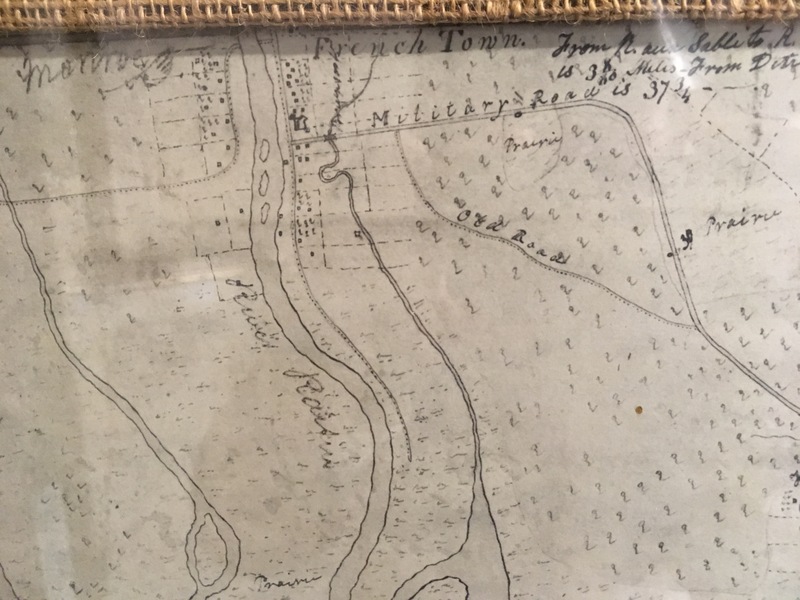 As a British soldier at the ill-famed Battle of Copenhagen, Mr. Bentley deserted, as did many of his comrades, and in 1803 came to the River Raisin. He joined the militia company here of Capt. Issac Lee. After Winchester was defeated here, Bentley and 16 others from Frenchtown joined Gen. W.H. Harrison's force at Maumee and fought in the two sieges of Ft. Meigs. He frequently ran the gauntlet of British and Indian fire to bring water from the river. Harrison sent him to carry messages from the besieged fort to other posts. After the war he carried the mail from Maumee to Detroit, on horseback or, in wet weather, by canoe. With James Knaggs and Medard Labadie, both of Frenchtown, he was in the Battle of the Thames and all three witnessed the death of Tecumseh at the hands of Col. Richard M. Johnson of Kentucky. 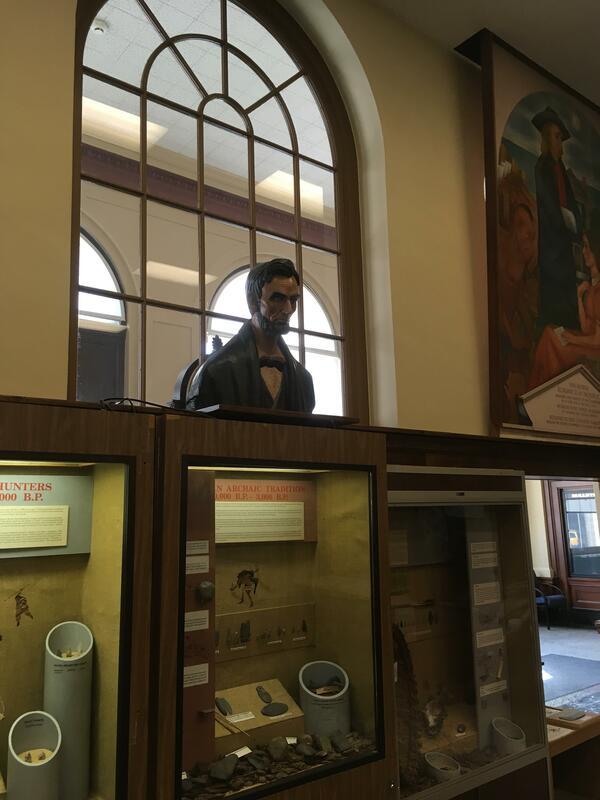 His wife came to Frenchtown with her stepfather, H. Brooks, and Stephen Downing in 1815. The Bentley and Downing farms adjoined. Here is the roll of Cornet Lee's troopers. 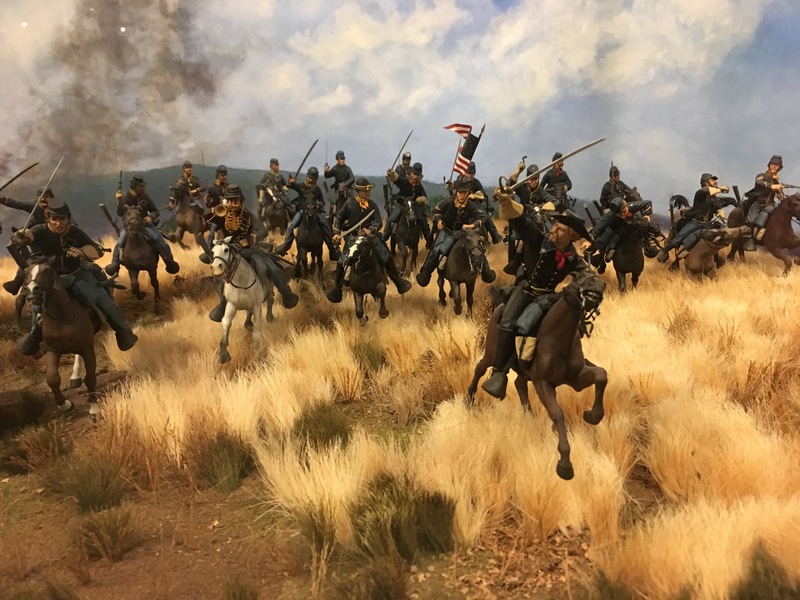 They would have been attached to Major James V. Ball's Squadron of Light Dragoons and fought in most of the engagements and skirmishes of the 1813 campaign in the Northwest. 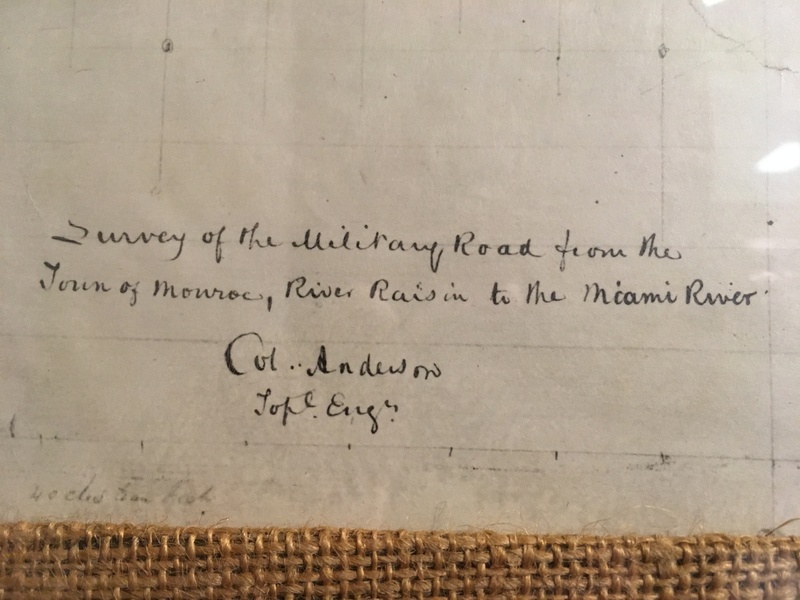 More information about John Anderson, an early graduate of West Point who served in the War of 1812 as well as in the Topographical Engineers after the war. Second Lieut., Reg. of Artillerists, Dec. 9, 1807. 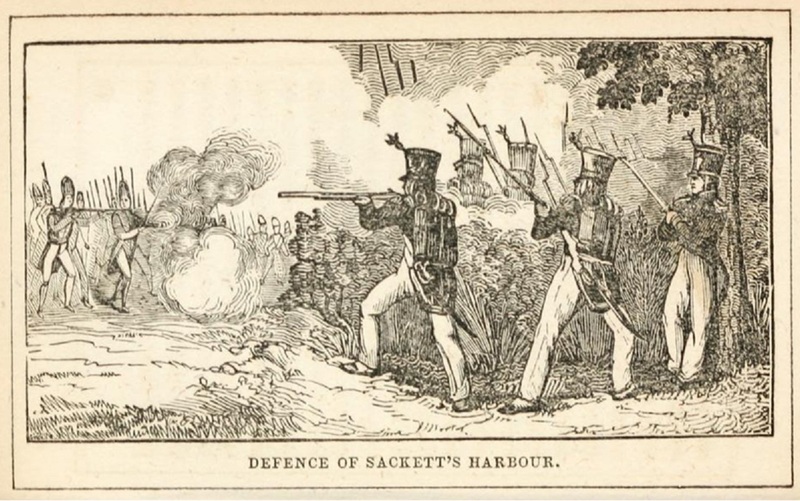 Served: in garrison at Atlantic posts, 1807‑11. First Lieut., 19th Infantry, July 6, 1812. New England Coast, 1826‑29, — of Hudson River, 1829, — of Taunton and Weymouth Canal, Mas., 1833, — and of the Shores of the Northwestern Lakes, 1834. Died, Sep. 14, 1834, at Detroit, Mich.: Aged 54. Pittsburgh, though a hundred miles or so from the front lines and never directly threatened during the War of 1812, was vital to the war effort. Simply put, it was the "hub" from which supplies and most manufactured goods moved over the mountains separating the United States east coast from the interior of the continent were transshipped from horse-drawn Conestoga wagons and put onto boats to descend the Ohio and Mississippi Rivers. Most of these boats would have been the versatile and ubiquitous keel boats of Mike Fink fame. Fink himself was active on the Ohio and Miami Rivers about this time. 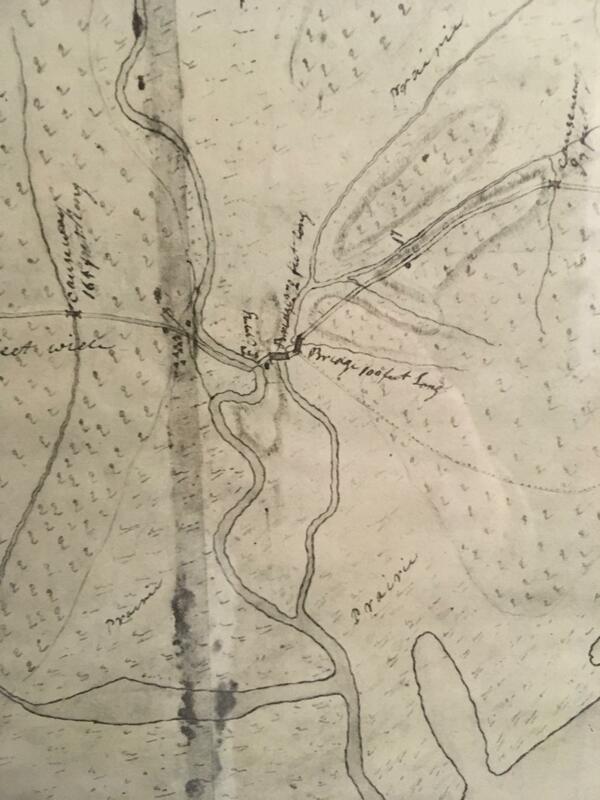 Fort Fayette in 1795 can be seen at the top right corner of this map of Pittsburgh. Fort Pitt is the large star shaped fort at the point, and the ruins of French Fort Duquesne lie at the very end of the point. When the War of 1812 began, a torrent of supplies and equipment and even ordnance began moving through Pittsburgh. The iron industry was already in its infancy there, and was given a boost by military contracts for cannonballs and eventually the iron fittings for the squadron building at Erie, PA. The small Army post at Fort Fayette, about a mile from the confluence of the Allegheny and Monongahela rivers, which had replaced the old British Fort Pitt in 1792, became a center of bustling activity. The responsibility for making sure the supplies got to where they were needed devolved upon a junior officer of the 1st Regiment of Infantry, Hezekiah Johnson. Lt. Johnson seems to have been at odds with both General William Henry Harrison, who depended on him for supplies, and the teamsters who contracted to move the heavy army shipments. He also had to work with Major Amos Stoddard, who was the officer in charge of preparing ordnance and ammunition for the Northwestern Army to replace that lost at Detroit in August 1812. New Orleans and St. Louis were also supplied from this point. Because everything issued to the army in the west and south passed through this point, the surviving records (many of them penned by Lt. Johnson himself) offer a good picture of what kinds of equipment and clothing would have actually been available to the soldiers of 1812. Fort Fayette was replaced by the Allegheny Arsenal in 1814, which continued to be an active US Army post through the Spanish American War. Once again this year I was able to attend the annual reenactment of the Battle of the River Raisin in Monroe Michigan. It's a unique event for us 1812 reenactors, since it occurs well off the normal season of the hobby and is staged on private land next door to the battlefield National Park (because of the NPS rules against opposing line tactical demonstrations). The reenactors sign in at a hockey rink, and then stage from the rink's parking lot for a brief battle in an empty lot next door, then march to a memorial program at the National Park Service visitor center a block away. It's a small event but I'm proud to be able to honor the men who fought there in this small way. This year I was part of the British artillery crews. 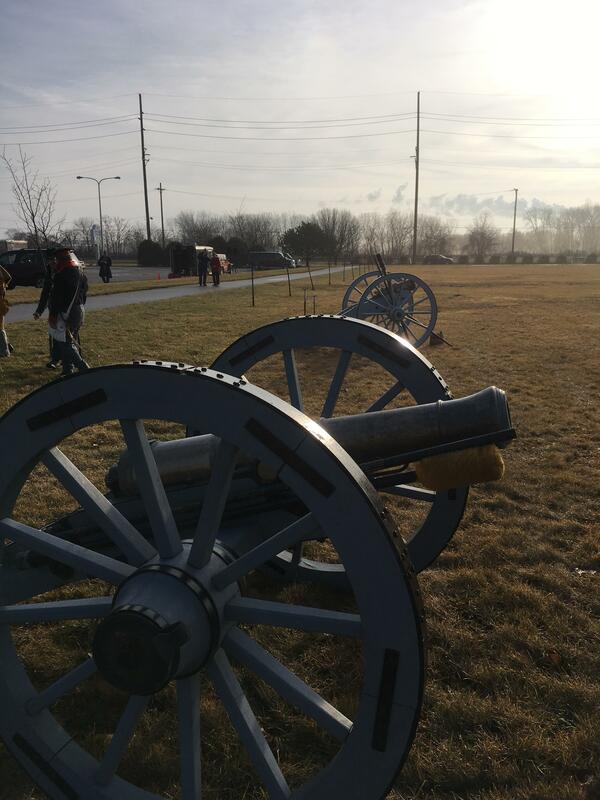 Since the Americans at the historical battle had no artillery with them, when we take our cannon the American artillery switches sides for the event. British Royal Artillery wore a blue coat with red facings and yellow tape, same as the Americans, so we actually look correct from a distance. 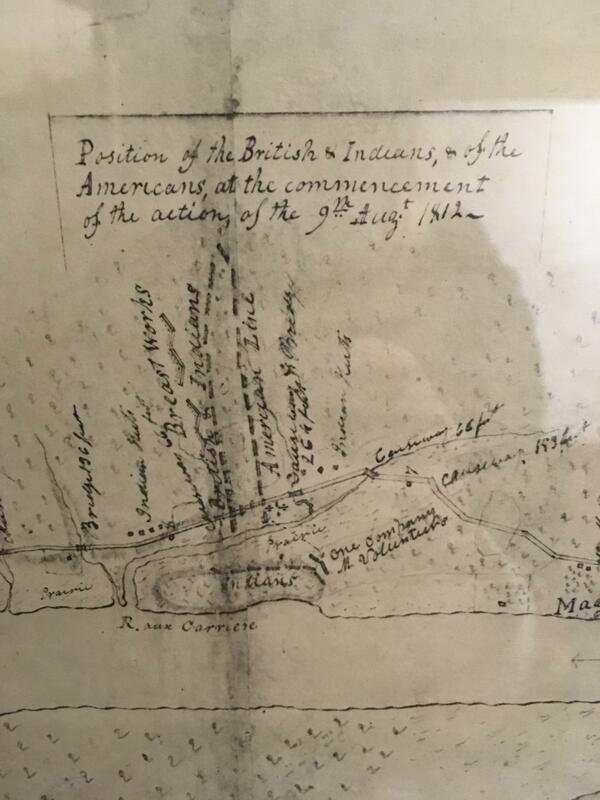 Afterwards there was a program given by the NPS ranger from Perry's Victory and International Peace Memorial at South Bass Island, covering the naval campaign of 1813 on Lake Erie and the Battle of September 10, 1813. Even I learned new things. The Monroe County Museum occupies an old post office downtown. 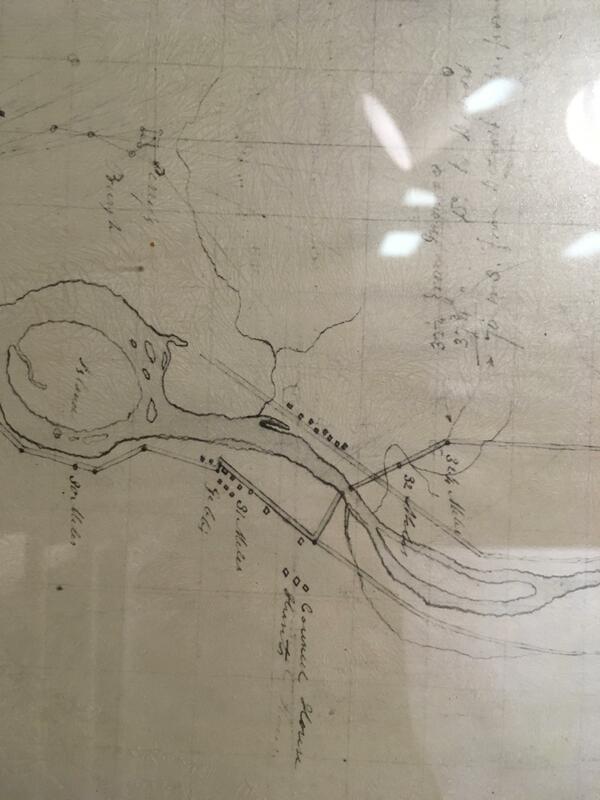 I was interested to find a collection of old maps of the area on display, particularly an 1817 engineers survey of the military road between the Maumee River and Spring Wells. You can still visit a section of the corduroy road, as I did a few years ago.